A Dia de Los Muertos mural by Diego Rivera. Note—An oldie but goodie revised. 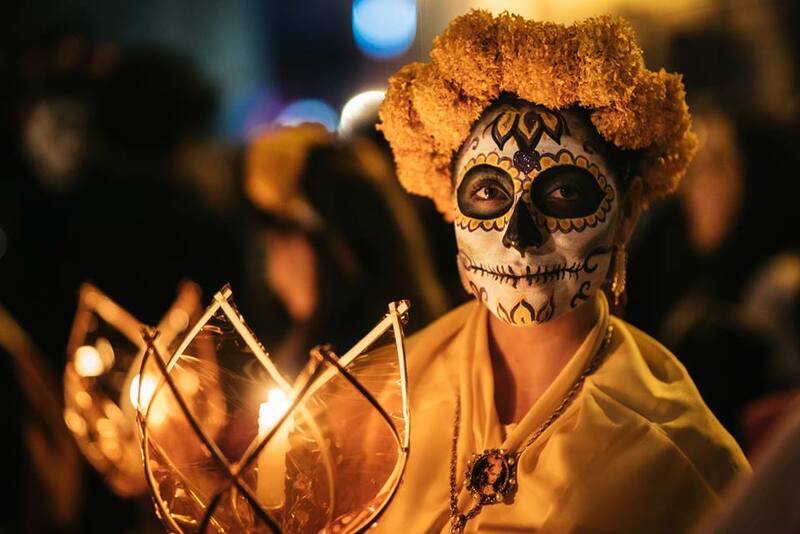 Despite sharing some key common imagery—skulls and skeletons—and some cultural and religious DNA, Día de los Muertos, the two day festival from Mexico, is not just a Latino Halloween. The two observations reflect two entirely different views of death—one reflecting terror and horror and the other welcoming acceptance. That’s the shorthand for it anyway. In reality it is, of course, more complicated. 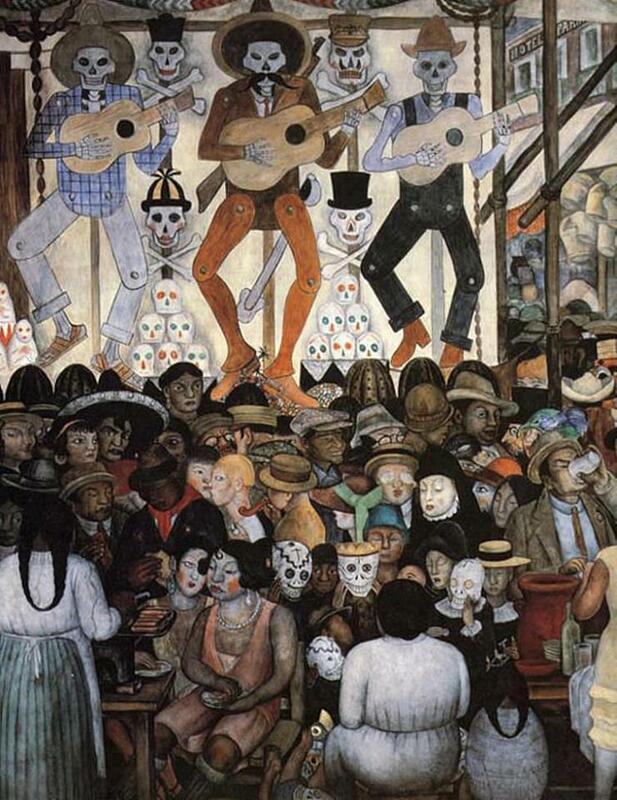 The Mexican holiday owes its unique vitality to the merging and mutual corruption of two cultures so alien to each other that at first the seemed totally incompatible. The Aztecs were the new kids on the block. Just the most recent in a chain of high civilizations that had risen and fallen in Mesoamerica over a period of 4,000 years—the Olmec, Maya, and Toltec to name a few. There were serious ethnic, cultural, and religious differences between these groups, but archeological evidence shows that they shared a view of the afterlife—a cyclical pattern of life and death that was continuous and in which the spirits of the dead were a protective presence to the living and under the right circumstances the living and they could communicate. Death was not seen as something grim, but as a natural step in continuing existence. This belief manifested itself in many ways, including some that to European eyes seemed barbaric and brutal beyond imagination, especially the mass human sacrifices as practiced by the Aztec. But, at least theoretically, those sacrificed were expected to undergo the knife in a state of religious ecstasy as they transitioned to the next life for the good of their people. Of course in practice, the Aztecs often used hundreds of their captured enemies for the rituals and they may not have been so sanguine to their fates. Mictecacihuatle, Aztec Queen of the underworld and eater of souls. But beyond the sacrifices, these beliefs meant that ordinary people could commune, even celebrate, with their lost loved ones. 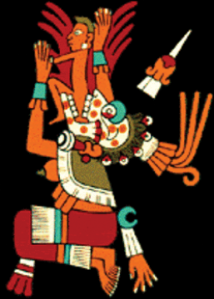 The Aztecs expressed it in a month long festival honoring the goddess Mictecacihuatl, Queen of the Underworld, or Lady of the Dead. During the festival they first honored los angelitos, the deceased children and then those who passed away as adults. The Mictecacihuatl festival was held during the late summer period of the corn harvests, a natural time of bounty and celebration. Enter the Spanish, their soldiers and priests who conquered the mighty Aztec—with the significant assistance of other civilized vassal peoples who were tired of giving up their corn and sacrifants to the mighty rulers of Tenochtitlan—who had very different ideas. The first order of the day, going hand-in-hand in making the conquered people slaves, was destroying all vestiges of the old religion and imposing Catholicism on them. After all, saving the souls of the savages whether they liked it or not was a central mission of the Conquest. The Church, of course, had a lot of experience in this sort of thing. Hundreds of years earlier it had encountered, squelched, and absorbed the pagan Celtic and Germanic peoples. The Church had learned to adapt local customs that could not be obliterated and cloak them as Christian traditions by turning old gods into venerated saints. The transformation of the popular Celtic festival of Samhain, for instance, had been transformed into All Saints and All Souls Days. Similarly in Mexico they re-purposed the Mictecacihuatl festival and squeezed it down from a month to the same two days coinciding with the end of the European harvest season on November 1 and 2. Indio peons were expected to attend masses to honor their dead—a least those who had died as good Catholics. And this the people dutifully did. Indeed at first they had no choice, but eventually they internalized the changes and accepted them. While the people accepted the masses, they brought their own interpretations to them, and they continued to hold onto folk traditions that stretched back to Pre-Columbian times. A home ofrenda or alter to the family dead festooned with sugar skulls, skeletons, marigolds, paper cutouts, and favorite food and drink of the departed. Over generations those traditions blossomed into Día de los Muertos as we know it today—spilled out of the churches and into homes where ofrendas, welcoming altars to the dead, are gaily decorated with skeletons, skulls, Flor de Muerto—orange marigolds, candles, religious icons, photos and memorabilia of the dead and groan with gifts of sweets, favorite foods, and alcohol. These altars welcome the spirits of the visiting dead. Then in many places families return the favor by visiting the cemeteries and picnicking on the graves of loved ones. In some areas of Northern Mexico the family might camp out there from the evening of All Saints Day, November 1. There are many regional variations involving parades and special celebrations in the homes where someone has died within the year which are opened to all visitors who are fed with homemade tamales and other treats. Artist Jose Guadalupe Posada populrized skeletons playfully cavorting in the 19th Century. 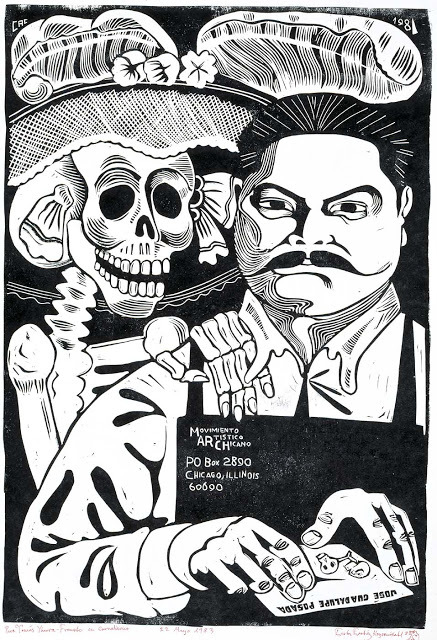 Chicano artist Carlos Cortes, a close freind and IWW Fellow Worker, commemorated Posada and his creation Catrina in this linocut poster for the Movement Artistico Chicano in Chicago. The frequent use of skeletons and skulls is meant as a reminder that we are all mortal and will someday join the dead. The popular 19th Century artist José Guadalupe Posada who depicted calacas—skeletons—cavorting gaily is credited with popularizing that sort of imagery which is continually re-interpreted by folk and fine artists. Particularly popular is the image of Catrina, the lanky, skeletal female figure bedecked in sumptuous clothing and giant ornate hats, who serves as a reminder that death is a fate that even the rich can’t avoid. Catrina is also seen as an embodiment of old Aztec goddess Mictecacihuatl. 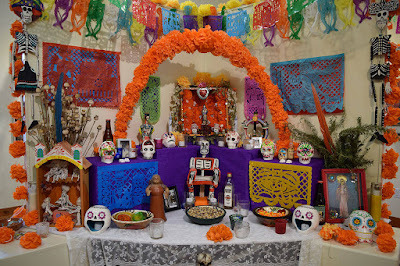 Other countries of Latin heritage have significant All Saints and All Souls celebrations, but outside of Mexico and adjacent countries with significant Mexican populations or cultural influence, none celebrate Día de los Muertos in this unique way. The images were recently popularized in the United States by the 2017 Disney animated film Coco which unlike some previous productions from the Mouse House was sensitive and respectful of the culture it depicted. 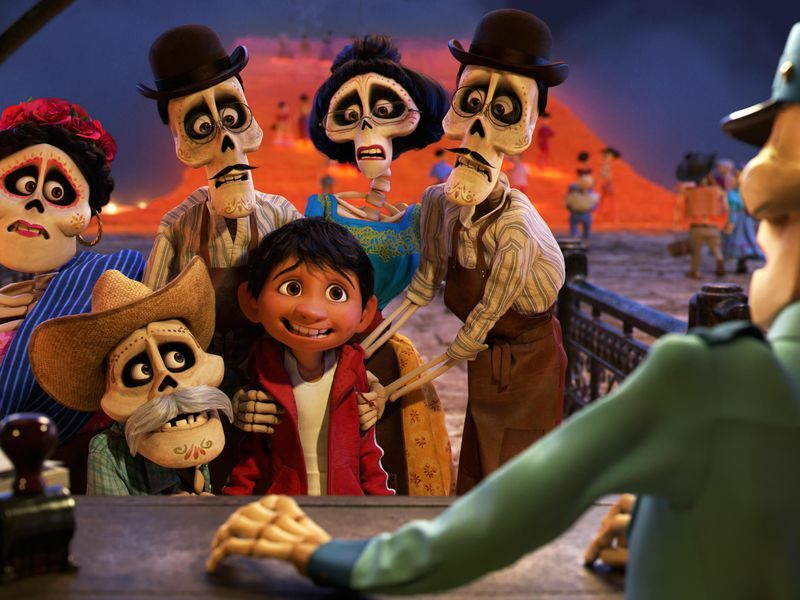 Disney's animated feature Coco was surprisingly respectful of Mexican culture and tradition. The U. S. with a large and growing population of Mexican descent or origin is one place where the festival is widely celebrated, particularly in the Southwest and border regions. But with large population moving north into the old industrial cities of the Midwest and Northeast and into rural and small town communities, the custom has spread, adapting to new circumstances. Anglo children are introduced to the Festival, stripped of religious significance, as part of their cultural awareness curriculum now in many schools. Street festivals featuring revelers painted to look like skeletons are popular in cities like San Francisco and draw many non-Mexicans. A woman in costume at an American Day of the Dead street festival. The spirituality of Día de los Muertos and its unique view of death and the relationships between the living and the dead appeals to many in this country looking for new religious experiences. Many non-Catholic churches now have Day of the Dead services or host family gatherings. It is commonly observed in many Unitarian Universalist congregations which strive to navigate he tricky ground between respect and cultural misappropriation. My church, the Tree of Life Unitarian Universalist Congregation in McHenry, Illinois had regular Day of the Dead services for well over a decade.